Q (Marcus_AUS0803): Hi Darmian. I will be coming to Hong Kong for a trip next month. Wondering if you can give me some Hong Kong tailor recommendations – which ones are better ones in the city? A (Darmian): Thanks for your email, Marcus. There are many “good” high quality tailors in Hong Kong — Dream Bespoke, British Tailors, L&K Tailor, British Textiles, Fascino Bespoke, The Professional Tailor, Dynasty Tailor… many many true-hearted & quality tailors in the city! 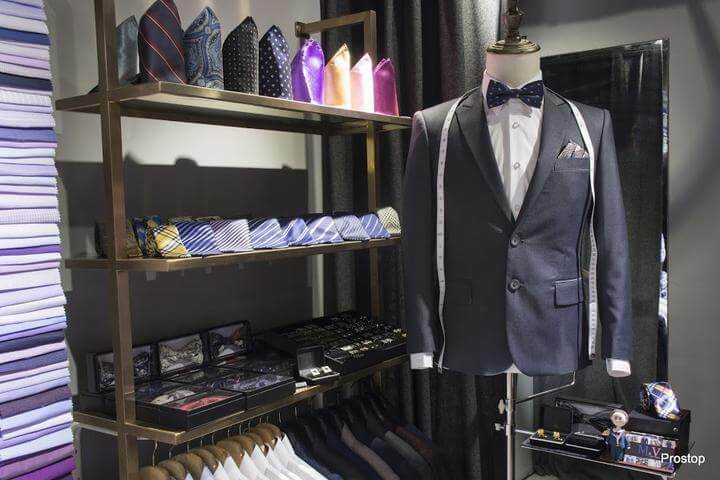 A 2-piece tailor-made suit (1 jacket + 1 pants) by Hong Kong tailors generally start from HK$2,000 (US$250), up to over HK$10,000 (US$1,300). The price difference is mainly due to the difference in suit construction methodology. 1) For Made-to-Measure suits, the sewn is from a standard-sized base pattern, production cost is lower; or Bespoke, pattern is created for each individual wearer and no modification or use of base patterns, this is of higher cost). There are over 400 tailor shops in Hong Kong, you may easily get one near the hotels you’re staying. But don’t get to the “wrong” one. The duration of your stay affects 2 things – 1) how many fittings can you attend, and 2) the delivery method of the final products. If you’re staying less than a week: I’d suggest you to try those “express tailors” that can have give you the first fitting within 1-2 days. Tailoring is all about “fitness” of the suits/ shirts. Try & give yourself at least 1-2 fitting sessions. Without the fittings, it is hard for tailors to adjust the suits/ shirts according to your body shape. Normally, “express tailors” can give you the final products in 3-4 days (from fabric selection/ body measurement, first fitting, to pick-up the final products). Stay more than 2 weeks – You can have even more options apart from “express tailors”, or products require even more details to attentions, for example, a fully-bespoke suit or suits with hand-stitching lapels. 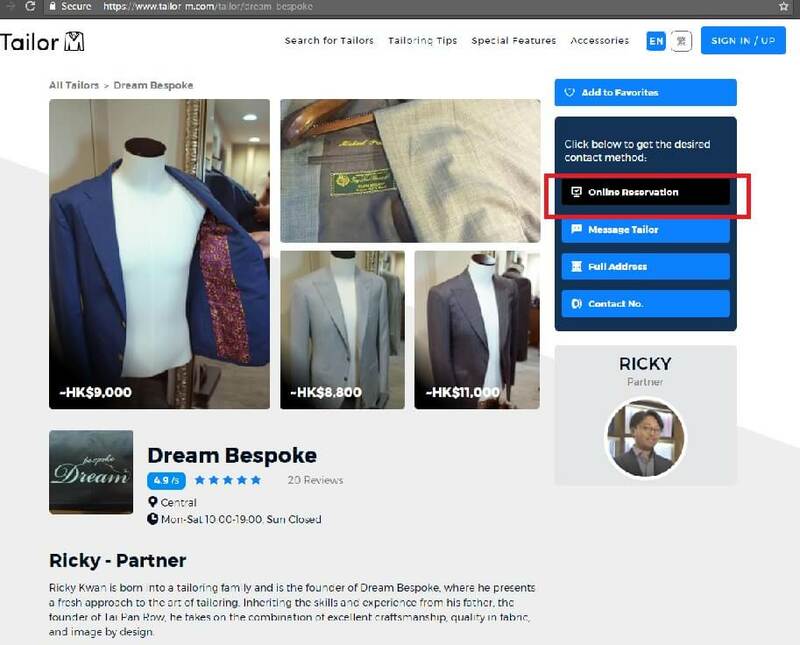 If you are to visit a tailor shop in Hong Kong, Darmian strongly recommends readers to make bookings / online reservations in advance. 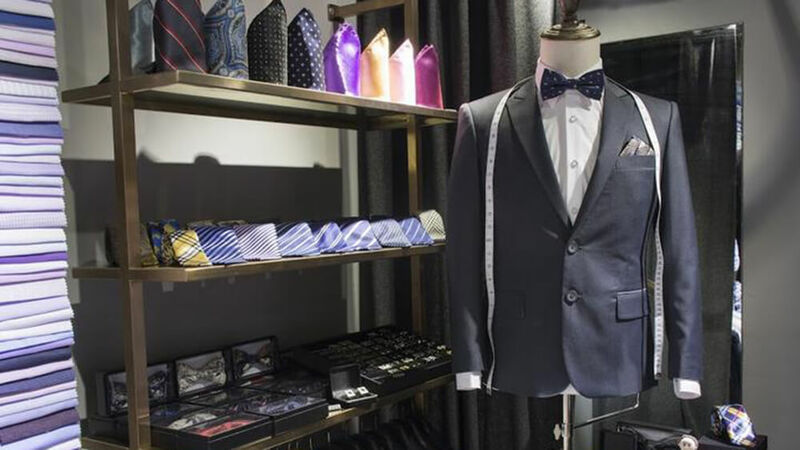 Most of the tailor shops in Hong Kong are operated by individuals rather than chain companies, the shop owners usually take care of many different tasks from on-site serving customers, to off-site fabric purchase. If you want to get served by the shop owners (usually the most experienced guy in the shop), don’t forget to make an online reservation in advance. 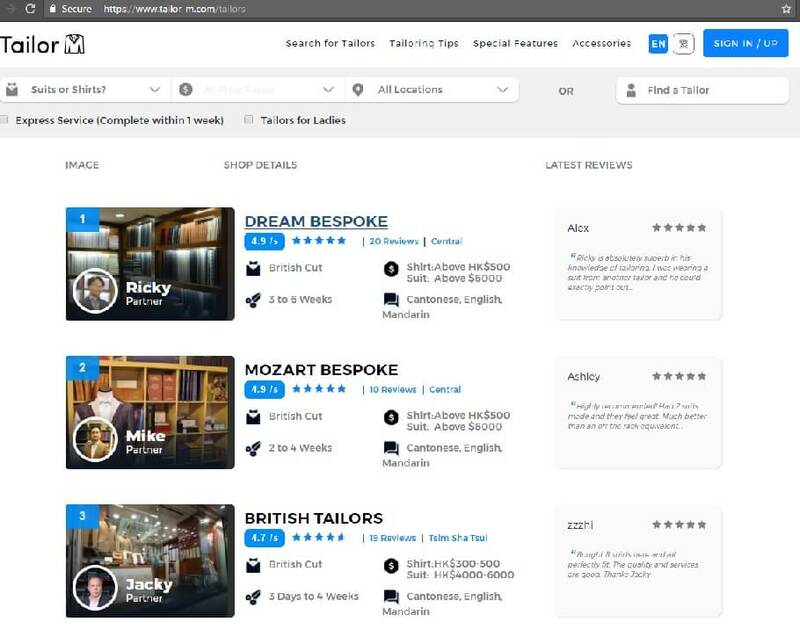 You can easily make a FREE online reservation with different Hong Kong tailors through Tailor-M.com, an online Hong Kong tailoring platform. Tailor-M also provides lots of helpful tailoring tips and trends in the tailoring industry.